Dr. Deepa Verma is the founder of Synergistiq Integrative Health, a holistic treatment facility located in Clearwater, FL. 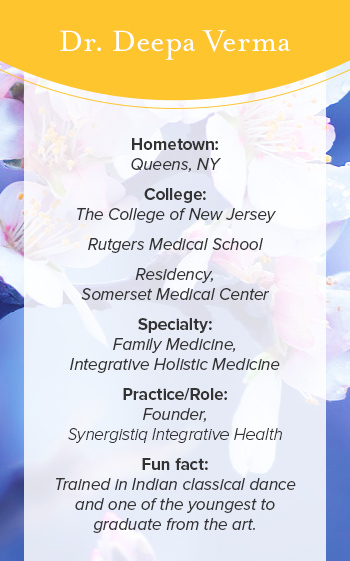 A graduate of Rutgers Medical School (formerly Robert Wood Johnson Medical School) and family medicine residency at Somerset Medical Center, Dr. Verma is certified in both integrative holistic medicine and family medicine. Dr. Verma is also an active author, and her various articles and blogs have appeared across several publications. Dr. Verma is active in many other mediums, appearing in a documentary for integrative medicine entitled Voices in America, as well as the pilot Plant Based, airing on A&E's FYI channel in 2016. When she’s not busy at work, Dr. Verma brings her philosophy of holistic health to a variety of hobbies, from fitness, to healthy cooking, to an accomplished career in dancing and tennis. Question: Where did your interest in the integrative health community begin? Dr. Verma: It’s always been this innate passion I’ve had. I am of Eastern-Indian origin and when I look at integrative medicine, it is really based on having more complete, holistic view of the patient, which is something it shares with Ayurvedic medicine. I am a traditional MD by training. I worked as an outpatient family physician for many years, but it wasn't something that I was passionate about. I wasn't really finding the root of patients' problems and was instead throwing pharmaceuticals at them. I don't live my life that way and I wasn't comfortable having patients do that. I decided I needed a change and I opened up my own integrative practice. It was during a very critical point in my life. Opening up my practice was, in essence, a revival of my spirit. Run us through the day-to-day of your business. My practice is pretty unique because I do everything on my own. I don’t have any staff. I’m the doctor, nurse, receptionist, office manager, and janitor. I answer all the phone calls, all the emails. That means I also have to be very personal and personable with my patients. I’m in constant communication with them, with tons of emails and texts. Telemedicine is also a very important factor. I have a lot of patients who are not local to me and can’t come to my office. I do a lot of phone consults, FaceTime, Skype, anything technology based. If they really want to see you, you can make it happen. I take pride in that because I invest a lot of time and energy, and the results I’ve seen from people I work with make the whole process worth it. How do you find the time to create all this content while working with patients? Do you have any secrets? I often ask that myself. “Where do I find the time?” I don’t think I have any secrets. It’s like someone saying, “I just don’t have time in the day to exercise.” You’re not going to find the time. You have to make the time. I don’t know who can say it better than a single mom with three kids who runs her own business; if you really want to do something, if it’s a passion of yours, you just make the time to do it. It will be at the end of a long work day and I will have cooked dinner, taken my boys to their sports, and done their homework with them. By then it is 9:30 pm and I'll sit down for half an hour and write something. I think because it does come easily to me and I really do enjoy putting that content out there, I find a way and I make it feasible. You don’t have to be up until 3 am in the morning to do it all, but the passion has to be there. You have to want success as bad as you want and need to breathe, then anything is possible. What do you see in the future of Integrative Medicine? I believe the future is very bright. It is rapidly growing, and I only see positive things coming for it. There is a growing progressive theme amongst people in the western world. People are sick and tired of feeling tired and sick. They are becoming more aware of the restrictions traditional medicine has placed on their health. Insurance does not give you incentive to be healthy. It waits for you to get sick and pays for sickness. Insurance is reactive whereas being healthy is proactive. The progression has also made people more aware of living optimally. Life expectancy is longer, but the quality of life is still not there. You can do a lot of things on the outside, but if you are not working from the inside to take care of the underlying issues you have, it is never going to get you anywhere. Do you have any wisdom to share with practitioners just getting started? If you’re going to create a practice, you have to believe in what you’re doing, and you really have to agree with what you’re doing. There is no room for being a hypocrite, saying one thing and doing another. You have to practice what you preach. You have to believe that you can make someone feel better and that you're guiding them on their journey to health and wellness because it is going to happen. And you have to make sure that they understand it is going to be a perpetual evolution. It is going to be a slow, but positive, process. I think some people get impatient, they want instant gratification. I always tell people, “You are not going to wake up overnight feeling completely different.” When you are doing things in a proactive, preventative manner, it is going to take time. You are on your journey to wellness that will last a lifetime and start over 3 months, 6 months, 12 months. You are going to notice very positive changes. People always do, when they are putting in the effort.